When Intel’s research teams think about the future of computing – from mobile devices with near-limitless functionality to technology for the developing world to virtual worlds and advanced robotics, they are literally mapping our future (a future that could include, for example, a cafe table with networking ability). 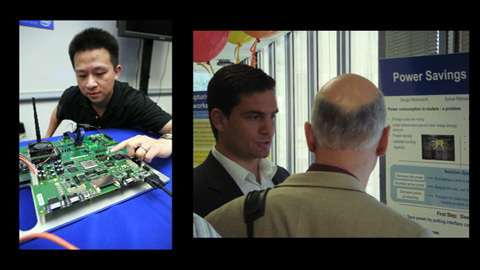 In this podcast preview of the 2008 Research@Intel Day, to be held at the Computer History Museum in the heart of Silicon Valley, we hear from some of Intel’s key players when it comes to the next generations of technology. Hear what Intel Research is focusing on now from Andrew Chien, vice president, corporate technology group and director of Intel Research; Intel Chief Technology Officer and Director of the Corporate Technology Group Justin Rattner; and Eric Brewer, director, Intel Research Berkeley. Research Day is a chance to check in Intel on the future impacts that its advanced chip technologies will have on human health, mobility, innovation and, of course, computing – from Terascale architecture, software and programming issues to visual computing challenges. You can hear more from Andrew Chien, here talking about essential computing, “the vision that drives Intel Research.” Justin Rattner shares some thoughts on virtual words as a precursor to the 3D Internet, and Eric Brewer, also a professor of comptuer science at the University of California, Berkeley, talks about how research from his Berkeley lab could lead to better technologies for the developing world.